The summer rush may be over but September and October are still a great time to visit. 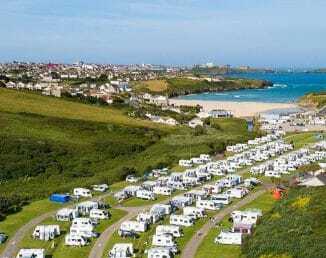 Enjoy a relaxing Autumn break in Cornwall at Porth Beach Holiday Park and avoid the crowds, the queues and traffic jams! The county is as magical out of peak season as it is during the height of the summer. Autumn is a unique and special time to visit Cornwall. It’s a season of dramatic skies, stormy seas and red sunsets and for those who like nothing more than enjoying the great outdoors it’s arguably an even better time to visit than summer. Why can I do on an Autumn break in Cornwall? By choosing an Autumn break in Cornwall at our holiday park, you’re in the perfect location to discover all that this county has to offer. From our holiday park you’re perfectly placed to enjoy coast and country, with some of the finest beaches, coastal scenery and moorland walks right on your doorstep. The summer visitor rush may be over but that doesn’t mean there’s nothing to see or do! Here’s some of the great events taking place locally that you won’t want to miss! Newquay Fish Festival, from 16-18 September, attracts thousands of people to the harbour to see cooking demonstrations from top chefs! One not to be missed! The Looe Music Festival, from 23-25 September, has really grown in stature over the years. With a huge stage right on the beach, the festival attracts some household names and generates a unique atmosphere. Eden’s Festival of Food, from 9-11 September sees an array of celebrity chefs giving demonstrations on a specific day during this amazing festival of food. Eden’s at it again on October 1st, with it’s ever-popular Beer Festival. It showcases a range of local beers and there’s also great food and live music too! If you like your action on the water then head over to Watergate Bay for the British Stand Up Paddle Surfing National Championships on October 8-9 The two-day tournament at Watergate bay will see a new British champions crowned. Falmouth is the location for an extremely popular event from October 13-16. The Falmouth Oyster Festival is packed with cookery demonstrations by leading local chefs, oysters, seafood, wine and local ale, sea shanties, and marquees brimming with Cornish produce. Away from the local events, Cornwall in the Autumn is the perfect time to explore the county’s many beautiful destinations, without having to fight for car parking spaces or beat the queues! Just a short drive from our holiday park is the pretty harbour town of Padstow, made famous as the home town of celebrity chef Rick Stein. Further along the north coast is Port Isaac, a beautiful seafront village that’s better known by its on-screen name of Portwenn from TV’s Doc Martin. Both are well worth a visit. The Camel Trail, which runs between Padstow and Bodmin, is extremely popular with tourists. Visit in September and October, however, and you can beat the summer crowds and enjoy this 18-mile stretch of disused railway line which takes in beautiful countryside and estuary views. Head west to see the iconic landmarks of St Michael’s Mount and Land’s End. Visit in Autumn and you will avoid the queues and the crowds. Enjoy a fish and chips on the beach looking out at St Michael’s Mount… what a way to end the day! There’s so many great reasons to choose an autumn break in Cornwall, including some big savings! Keep an eye on our Special Offers page. for regular money-saving deals to help your holiday budget stretch even further! To book your autumn break with us call today on 01637 876531 or book on-line here.